Natural Resources and Environmental Science is a major for students who want to contribute to environmental change in the world. This is a science-based, interdisciplinary program. With guidance from the NRES academic advisor and faculty, students design a plan of study that fits their interests and professional goals. Graduates work in business and industry, consulting, nonprofit organizations, and state and federal agencies. Others continue their education in environmental science, engineering, or environmental law, or conduct research at a university or in industry. Every year, Kasha Halbleib's family would go camping. And every year, Kasha would pick up bugs that interested her and hear "Kasha, put that down!" At that point in her life she was interested in environmental life but didn't realize she could study it. Then, in high school she took an AP environmental science class and thought "Oh, my gosh, this is perfect! This is exactly what I want to do.” After that, she looked for colleges where she could pursue a degree that kept her in touch with nature. Kasha's College of Agriculture tour was such a good experience that she couldn't pass up the opportunity to come to Purdue. "Purdue numbers-wise looks overwhelming," she says. "It's a big school but has a small feel — putting people in majors in small classes together, but with big-school opportunities." She almost immediately joined the Environmental Science Club. Kasha found Spanish Club on a whim and loved it. Every year she tries new clubs, leaves some, and expands her social circle. It's given her multiple circles of friends. 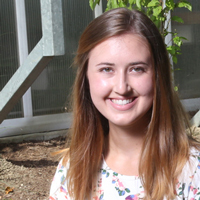 "I have a tight-knit group of friends, and we do a lot together," Kasha says, "but there's a different group of friends in environmental science. And I tag along with other groups of friends." She loves to hike or go to cultural and social events around campus. Last year the group ended up at Malaysia Night, Diwali, African Immersion Night, a drag show, the Rocky Horror Picture Show, the Christmas Show, Around the World Night, a Caribbean event, Black Cultural Center events, and more. She really enjoys volunteering. "A favorite experience is with higher-level Spanish students where we go to local schools and work with English as a New Language students in a program called Auyda y Aprende," she says. "We help with homework, talk to teachers. They get our help, we get to practice languages skills. It helped me get confidence while helping others in the community." Kasha spent a semester in Madrid, where her Spanish got even better. "Study abroad improved my language skills tenfold," says Kasha. "I didn't know the intensity until I got there. It was a six-month immersion program…classes, roommates, everything in Spanish." Eventually, she could hold a conversation or comfortably order items at a store. Back in Indiana, Kasha interned two separate summers at Cool Creek Nature Center in Carmel, where she cared for native species animals, taught children about animals and butterflies, and worked on programs and campfires. “My internships have been a great way to learn while on the job. It’s an amazing experience,” she says. Kasha's internships helped her focus on career choices. Now she's planning to attend law school after graduation to earn an Environmental Law Degree. It sounds like a perfect way to connect her career with the environment she loves.